Why are herbicides used in Oregon’s forests? Oregon is one of the best tree-growing regions in the world, but even our fast-growing, native species such as Douglas-fir can be smothered by weeds and other broadleaf plants. Both native species such as vine maple and invasive species such as Scotch broom and Himalayan blackberry can quickly overtake seedlings. New trees need to outgrow the faster-growing weeds and brush around them in order to survive their first few years. In fact, landowners are required by state law to make sure this happens. That’s why private forest landowners use herbicides to control competing plants and let the trees get a head start. After the trees are 8 to 10 feet tall they will shade the ground, and the weeds will die off naturally due to lack of sunlight. Herbicides are typically applied on any piece of ground just two to four times within 40 or 50 years. By the time young trees enter their second or third year, they are usually outgrowing the other vegetation. At that point, there’s no need to apply herbicides until the next harvest several decades later. Herbicide use is highly regulated. 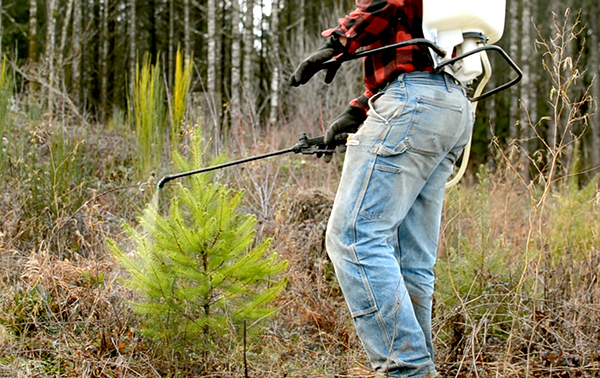 Throughout Oregon, forest herbicides account for just four percent of all pesticide use. In some dry-forest types in eastern Oregon, herbicides are rarely if ever used. Never spray near streams with fish or around municipal water supplies. Complete a mandatory written plan for any chemical application within 100 feet of fish-bearing streams. Dispose of waste and chemical containers properly. Follow stringent rules for aerial applications. It is illegal to apply herbicides when weather conditions would cause the product to drift off-target. Follow all label restrictions, along with the rules of the Environmental Protection Agency, the Oregon Department of Agriculture, the Oregon Department of Environmental Quality, the Oregon Water Resources Department and the federal Occupational Safety and Health Administration. Join Mike Cloughesy and Nicole Strong as they discuss why foresters use herbicides in a newly planted forest. By giving young trees an early advantage, herbicides can speed the time it takes to develop a mature forest. After a few early applications, foresters rarely use herbicides again until harvest.